I have a friend who just loved our drinking jars, which we bought nearly fifteen years ago at store. She has been using mason jars without handles, but she liked ours with the handle so much that I have been looking for some for over a year...ever since she asked me where we had gotten ours. That is not to say I did not find any during the past year, but $10 per glass was a bit steep I felt, as much as I love her. So, imagine how elated I was to see a set of four drinking jars on sale for $10 in the Kohl's sales catalog starting this past weekend, plus I had a 20% off coupon; I planned on getting them eight glasses! We were having lunch out with this same family on Sunday after church and then we were going to do some shopping hoping they would take our daughter back to the church with theirs for practice for the Easter program. Lunch was great and they took off with my daughter so my husband and I were alone, such a rare event. 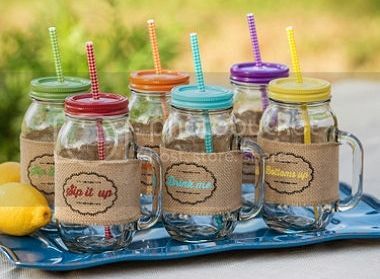 My husband wanted to go to Sam's Club before we went to Kohl's and that is when we saw this cute set that not only had colorful lids with two sets of matching straws, but also burlap sleeves with little sweet like sayings. Seeing that there was an orange one, my friend's absolutely favorite color, we got the set of six for $17 and never made it to Kohl's. Aren't they cute? I wanted to give the glasses to them right away, because I thought that my friend, also being a Sam's Club Member, might see them and buy them before their anniversary which is over a month away. So we gave them, unwrapped, when we picked up our daughter at their house. They really liked them as much as I hoped they would and, of course, my friend claimed the orange one the moment she saw it. Do I know my friend or what?